Retreats are a wonderful time to start journalling, a writing practice that enables everyone to get to know themselves better, plan their time more effectively and solve problems with greater efficiency. Musician, writer and Yoga Explorers teacher Sarah Williams tells us all about it. How many texts or emails have you written today? Most of us spend time writing because we have to, and it’s typically on a device, but taking pen to paper can be a powerful tool for growth and fulfillment, and this is called ‘journaling’. Journaling is open to everyone – you don’t have to be able to ‘write’ to be able to benefit from it. My journaling didn’t start with “Dear Diary” as a teenager, but with uncharacteristically messy and unpunctuated scrawls in an old text book in my thirties. Despite being a long-time yogi and teacher, I became very good at practicing while having an internal dialogue that was far from meditative. I was scrambling for mental clarity. But as time went on, keeping a morning journal became one of the most useful practices I’ve tried for reducing stress, watching my inner (predominantly negative) dialogue and relationship responses. Where does journaling come from? People have been keeping diaries and writing things down for a long long while, of course, but it was not until the mid 1960s when psychologist Dr. Ira Progoff began using a “psychological notebook” with his therapy patients. This was an intense process and differed from the usual narrative of a diary, as it focused on primarily on internal experiences. 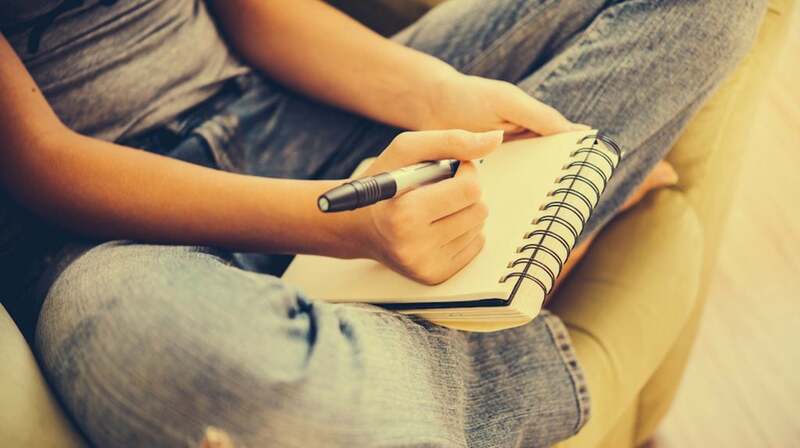 Reflective writing went on to become a therapeutic practice for self-exploration and healing, used in conjunction with psychotherapy and also as a stand alone therapy. During the 1990s journaling found popularity through Julia Cameron’s The Artist’s Way, a handbook for ‘creative recovery’. Her 12 week course is based around the concept of writing a free flow of Morning Pages to facilitate personal development. Today, it’s used by people far and wide to explore their hearts and get clarity on their lives. A wellbeing retreat is a great place to start journaling, when time away from the demands of the everyday can help forge new habits and separate us from the grind as we start new routines. Try it when you first wake up or outdoors in nature. Removing emotional clutter before we even have breakfast is an important element of being mindful and practicing self-care throughout the day – rather like a meditation practice. Having privacy is crucial, so that you do not censor your writing. And remember you’re not trying to construct your memoir, so let all the hunger, emotions and profanities flow – there is no ‘wrong’. Take your notebook on your healthy holiday and make your retreat last all year long by carving out this time for yourself both on retreat and when you get home. At first, the process of not knowing what to write can be overwhelming. Writing just after waking often starts with frustration and resistance, but after the initial blurts land on the page, you’ll find a platform on which you can get to know yourself better, plan your time more effectively and solve problems with greater efficiency. The first few pages may be filled with banal waffle and repetition, but after the first page or so and with consistency you’ll find you can begin to access what you desire, grieve and need to fulfil you. If you’re still at a loss for words, it can be useful to incorporate themes. You may want to dive into relationships, work, dreams, loss or gratitude – whatever takes your fancy. Whatever you chose to work with will not necessarily manifest in a linear fashion, and that’s okay. Having a focus can drive you forward in what you choose to explore and what you want to uncover. What can journaling do for me? There are dangers when we express ourselves on social media platforms, when we may find ourselves painting an ideal view of life that doesn’t ring true. Comparing ourselves to others and trying to capture the perfect photograph takes us away from the authentic expression of who we are. In contrast, there is no external judgment within the print of our diaries when we journal. The act of writing is not only cleansing, as you embrace what you really what to say, but illuminating, as it reveals your instinct and wisdom. A great way to highlight words and themes that recur is to revisit previous entries. This can be uncomfortable, but it’s especially helpful for identifying the self-critical voice that can be overbearing for many. By bringing awareness to both your negative and positive streams of thinking, you can track their patterns and gain the power to change or embrace them. Dealing with stress, overwhelm and busyness can be challenged with kindness through the medium of writing too. Journaling is also creative outlet for aspirations and life changes that you may have. Your journal may just be the place to design and visualise yourself living your dreams and changing your life. UK-based yoga teacher Sarah Williams teaches a mindful alignment-based style of vinyasa flow to encourage self-exploration and awareness of the body as a whole. She is a regular teacher on Yoga Explorers yoga holidays around the world, and also teaches in Brighton and London. You can find her at www.sarahwilliamsyoga.com and find out more about the Yoga Explorers retreat in Morocco, 28 April – 5 May 2018.